Rail Tank Car Improvements – Make Them Now! Just more than a year ago, on February 15, 2015, twenty-seven tank cars of a 109-car crude oil unit train derailed near Mount Carbon, West Virginia. 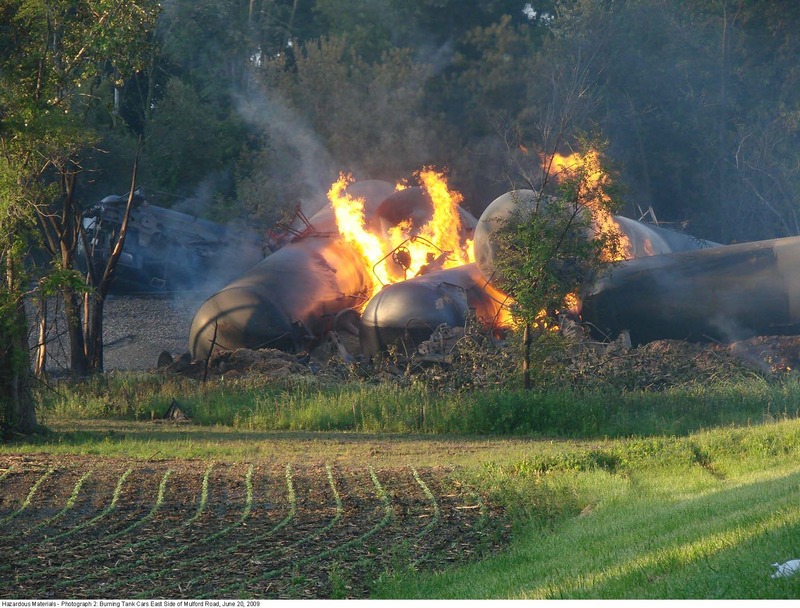 Crude oil was released from the derailed cars and immediately ignited into a pool of fire. Emergency responders evacuated 1,100 people within a half-mile radius of the accident and allowed the fire to burn itself out. All of the cars involved in the Mount Carbon accident were the enhanced DOT-111 tank cars built to the industry’s CPC-1232 standard, the best available general service tank car at the time of the accident. Yet, the fire created by two punctured tank cars resulted in 13 adjacent tank cars becoming breached when heat exposure weakened their shells, which were not equipped with thermal protection systems. The NTSB has investigated other recent train derailments in the United States involving the release of flammable materials and post-accident fires, including the 2013 derailment of 20 crude oil tank cars in Casselton, North Dakota; the 2014 derailment of 17 crude oil tank cars in Lynchburg, Virginia; the 2015 derailment of six crude oil tank cars in Heimdal, North Dakota; and the derailment of seven ethanol tank cars in Lesterville, South Dakota. We, in the United States, have been relatively lucky, because most of the accidents that have occurred here—while still terrible and frightening to nearby residents who witnessed towering fireballs—have missed densely populated locations. Such was not the case in Lac–Mégantic, Quebec, a community which was not so lucky. In 2013, 63 tank cars of a crude-oil unit train derailed there, killing 47 people and destroying much of the town. In Canada, the media and government agencies continue to cover the disaster’s aftermath—and for good reason. Twenty-seven children who lost one or both parents in the disaster, known as “the orphans of Lac-Mégantic,” continue to struggle through a life forever changed. Of 800 interviewees from the area, more than half suffered depression, PTSD, and other negative feelings. Almost one in four suffered a material loss. In all of these accidents, in both the United States and Canada, trains were carrying flammable liquids in DOT-111 tank cars. And in all of these accidents, the trains derailed. Keep the train on the tracks. Track defects are one of the leading causes of train derailments. Federal Railroad Administration (FRA) data show a steady decrease in track-caused accidents over the past 20 years, due to railroad emphasis on investing in infrastructure and technological advances in track inspection systems. Continuous improvement in track maintenance is critical to reducing the probability of accidents. Keep the product in the tank car. Everybody agrees that without major upgrades, DOT-111 tank cars are not up to the task of the transportation of hazardous flammable liquids. 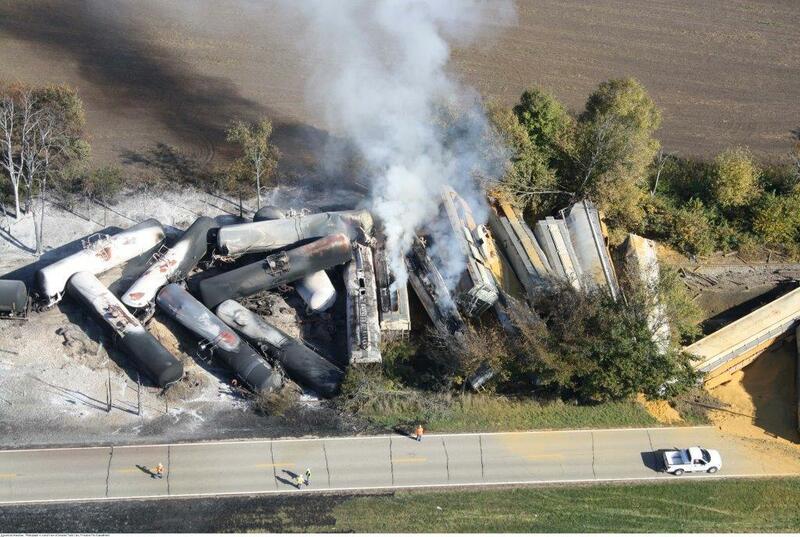 In response to these accidents, last year the DOT issued new tank car regulations, but with a generous phase-in period. The new regulations will require that cars carrying crude oil and ethanol meet the DOT-117 standard by 2025, and that tank cars carrying other flammable liquids meet them by 2029. But as accidents like those cited above vividly demonstrate, each day that passes until our nation’s present tank car fleet is replaced or upgraded is a day lived with elevated risk. Therefore, present day tank cars should be replaced or retrofitted to meet the safer DOT-117 standard—sooner rather than later. If the worst happens, ensure that first responders are able to respond safely and effectively to the disaster. It is important to understand whether transportation operators are applying sufficient operational safeguards to counter these risks and whether emergency responders have the knowledge, guidance, equipment, procedures, and training to keep pace with a multitude of potential threats from hazardous materials releases and other consequences of transportation accidents. The new DOT-117 standard includes tank head shields, thicker shell material for increased puncture resistance, tank jackets and thermal protection systems with reclosing high-capacity pressure relief devices, and stronger protection for bottom outlet valves and top fittings. While the NTSB has not independently determined industry’s capacity to retrofit or replace the existing tank car fleet, we would have preferred a more aggressive implementation schedule. Additionally, in the absence of intermediate milestones for full implementation of DOT-117 standards for all flammable liquids tank cars, it is up to fleet owners and regulators to ensure continuous and meaningful progress toward the use of more robust tank cars that are less prone to release products in accidents. Similarly, positive train control (PTC) was required to be implemented by 2015, but at the end of the year, the deadline was extended to 2018. Some railroads have already advised the FRA they will need an extension to the extension, pushing implementation to late 2020. It takes effort and money to make changes to enhance safety, and the NTSB applauds the efforts thus far to implement PTC. But it’s time to finish the job. Similarly, we await concerted efforts by the railroads to upgrade the existing fleet of DOT-111 tank cars in flammable liquids service to the new DOT-117 standard, or relegate them to the carriage of less dangerous cargo. A year after the Mount Carbon crude oil train fire, residents there know that they narrowly escaped their town becoming the American Lac-Mégantic – an outcome of a fiery derailment that could still happen at any moment. For that reason, our 2016 Most Wanted List of transportation safety improvements includes Promote Completion of Rail Safety Initiatives. The NTSB will continue to examine PTC implementation and the makeup of tank car fleets as factors in future railroad accident investigations, because these initiatives will significantly lower the risk of such railroad tragedies. Robert L. Sumwalt is a Member of the NTSB Board.